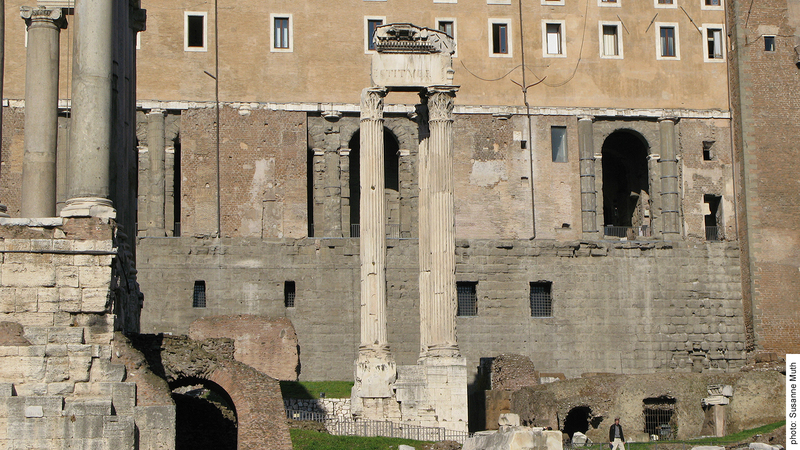 The dynasty of the Flavian Emperors chose to react to the dominating presence of the Julio-Claudian dynasty on the Forum by constructing the Temple of Vespasian. This reaction was targeted especially at the Temple of divus Iulius (deified Caesar, founder of the Julio-Claudian dynasty), which dominated the east side of the Forum with its prominent location and had firmly established the idea of worship of the ruling dynasty on the Forum. By erecting a further temple for a deified Emperor, Vespasian, the founder of the Flavian dynasty, on the opposite side of the Forum, the Flavians succeeded in creating a “Flavian antipole” on the Forum in an impressive and spectacular manner. When Vespasian, the first Flavian emperor, died in 79 A.D., he was deified as were several of the emperors preceding him. As a divus he had a right to certain cultic honours and a suitable temple. Both his sons – Titus, who was his successor, but died in 81 A.D., and Domitian, who succeeded Titus – decided to build the temple on the Forum – not outside of it, as had been the case for the temples for the divus Augustus or the divus Claudius. 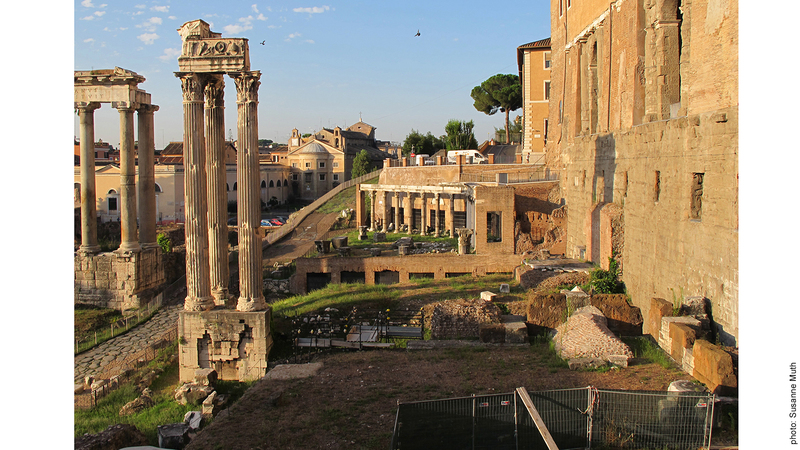 That this location was chosen for the temple illustrates how important it was to the Flavian emperors to present themselves and manifest their reign on the Forum. Undoubtedly the temple was erected under Titus (79 – 81 A.D.). However, its completion and dedication probably occurred under the reign of Domitian (81 – 96 A.D.) – the exact date remains unknown. The fact that Titus died shortly after Vespasian’s death and was also deified has led to confusion when attempting to identify the temple’s function. Some sources from Late Antiquity, as well as some scholars, have regarded it as a temple that was shared by the divus Vespasianus and the divus Titus. However, an examination of the dedicatory inscription which once adorned the architrave at the front of the temple reveals that only the cultic worship of the divus Vespasian was mentioned – if divus Titus was supposed to have been a figure for cultic worship, then it is to be expected that the dedicatory inscription would relate this fact to us (similar to e.g. the temple for the diva Faustina and the divus Antoninus located south of the Forum). The dedicatory inscription also informs us about the restoration of the temple under the rule of the Severan emperors Septimius Severus and Caracalla in the early 3rd century A.D. Based on the surviving architecture, which does not show any signs of substantial modifications made to the Flavian structure, it is plausible to assume that the restoration measures were not all that extensive. It is even possible that these restorative alterations were motivated by ideological rather than factual reasons in order to portray the Severi as the custodians of the legacy of the past and the rightful successors to the great Emperors of Rome (this also becomes evident when looking at the Severan restoration of the Pantheon). 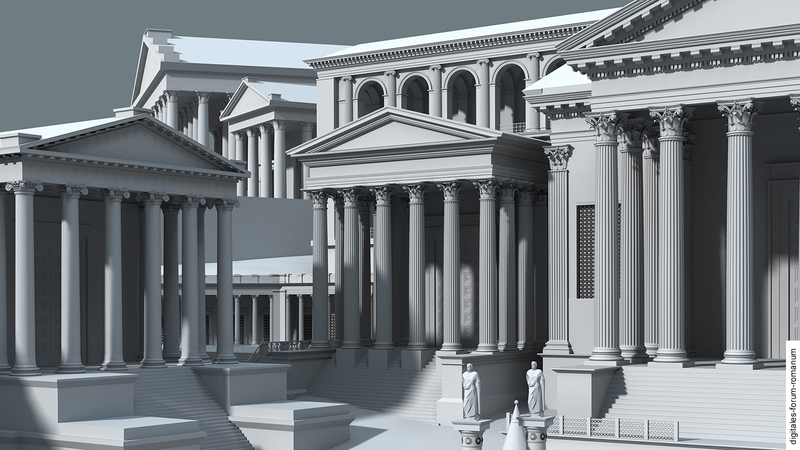 Creating a Flavian counterpart to the Temple of Caesar was a confident as well as effective manoeuvre. However, the circumstances on the Forum had changed considerably in the meantime. 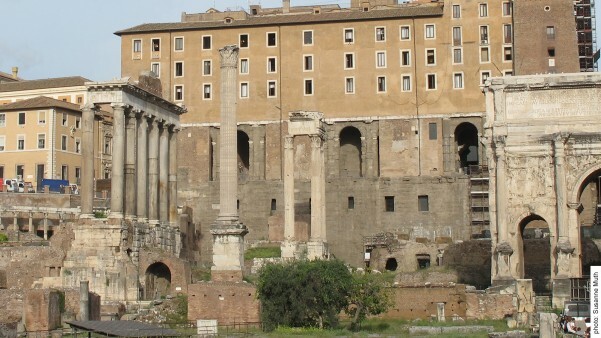 While Augustus was able make use of an ideal construction area for the Temple of Caesar on the east side of the Forum, where it dominated the Forum with its grandeur in the east, Titus and Domitian were confronted with a Forum that was already densely built-up. Where was the new temple to be erected? 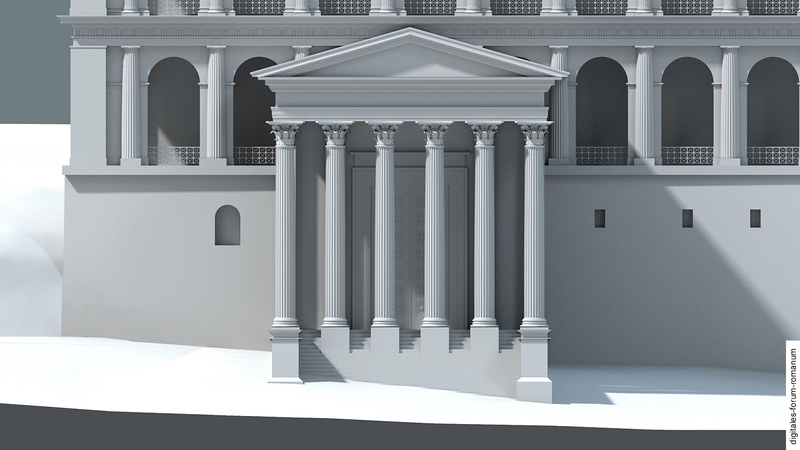 In the end the decision was made to use a comparably small area in the south-west corner of the Forum, located behind the Temple of Saturn and crammed between the Temple of Concord, the Porticus Deorum Consentium and the Tabularium. From this position, the Temple of Vespasian was unable to develop a visual dominance comparable to that of the Temple of Caesar. However, its location directly next to the clivus Capitolinus – the path that ascended the Capitoline Hill up to the main sanctuary of the city – endowed it with a different kind of topographical prominence. It remains unclear which structure had to give way for the Temple of Vespasian (for the late Republican phase most likely the Basilica Opimia; this basilica was torn down in the course of the Augustan extension of the Temple of Concord – or, at least, it was made a lot smaller). 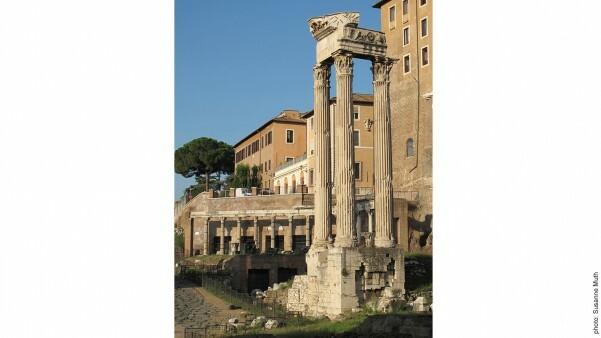 Whatever it was that stood there, it did not possess enough significance to save it from being demolished and replaced by the new temple for Vespasian, which was forcefully placed on the Forum. From the towering architecture of the temple three columns have remained standing on the temple’s podium and they designate the northern corner of the temple façade. Blocks of the architrave with the last letters of the inscription commemorating the Severan restoration as well as the adjoining roof beams rest on these columns. These remains from the upper architecture together with the foundation of the temple (composed of tuff and travertine blocks as well as of opus caementicium) allow us to develop a comparably reliable reconstruction of the temple. 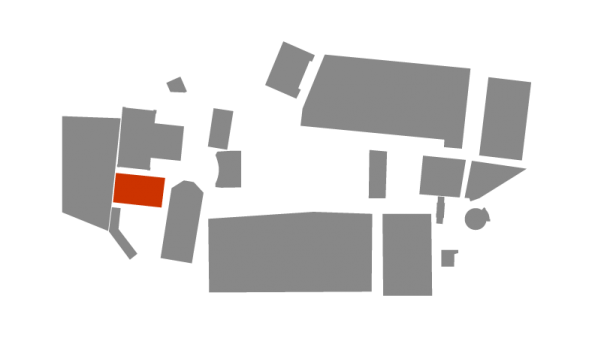 It was a mid-sized temple (ca. 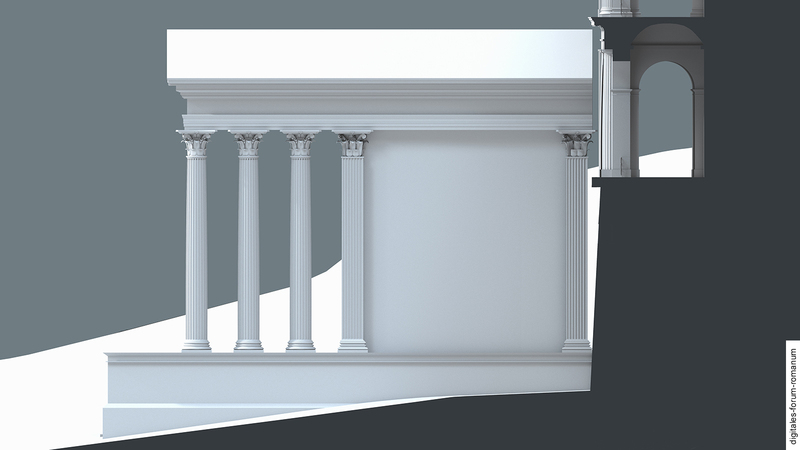 21 x 28 m within the layout) with six Corinthian columns at the front. 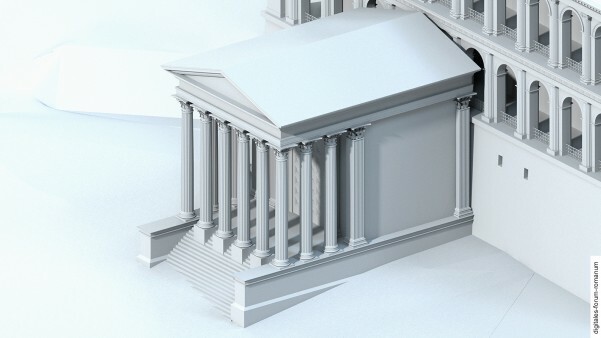 The conception behind the temple’s structure was heavily influenced by the small size of the area available for construction: Freestanding columns were only used in the temple’s entry hall (pronaos); apart from that, the cella wall was stretched outwards in order to create a big interior (cella) for the temple. 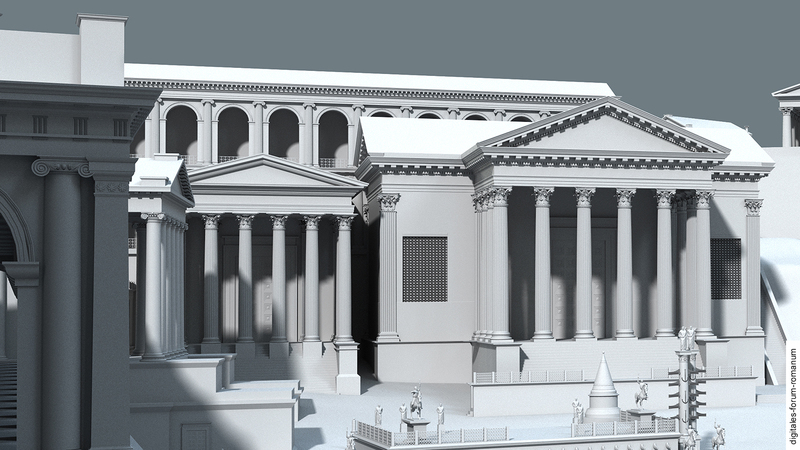 The back wall of the temple is directly located in front of the Tabularium. A steep set of steps at the front led up to the temple, whereby the upper steps had to be cut into the spaces between the columns (intercolumniae) due to the fact that there was so little space before the clivus Capitolinus. The sides of the architrave were decorated with a frieze depicting different cultic objects as well as the skulls of sacrificial bulls, thereby indicating the sacral significance of the building. F. Coarelli, Divus Vespasianus. Il bimillenario dei Flavi (Rom 2009). S. De Angeli, Templum Divi Vespasiani (Rom 1992). S. De Angeli, Vespasianus, Divus, Templum, in: E. M. Steinby (Hrsg. ), Lexicon Topographicum Urbis Romae V (Rom 1999) 124-125. H. Knell, Bauprogramme römischer Kaiser (Mainz 2004) 143-147. S. B. Platner – T. Ashby, A Topographical Dictionary of Ancient Rome (London 1929) 556.